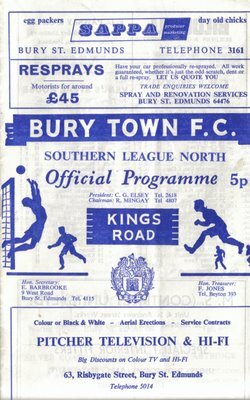 I used to have a very large collection of Bury Town football programmes but in moving house several times I have lost them. So many memories lost but not all forgotten. Bury are the fourth oldest non league club in England dating back to 1872. My earliest memory would have been in the mid 1960’s when I regularly attended the football ground at Kings Road. The main entrance was here though there was many a time we would climb over the fence in to the ground from Chalk Road. The car park at the back of Cine world is pretty much where the ground would have been. 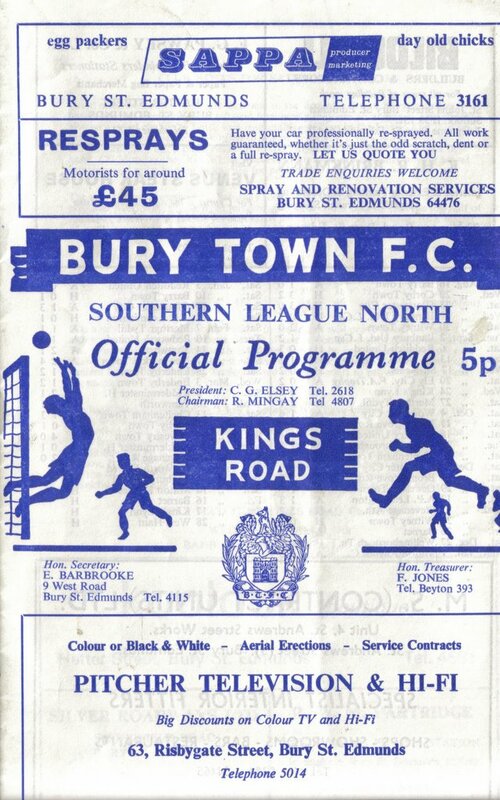 For many a year I also sold programmes for Bury Town and this got you free entrance plus a small amount of what you sold. I remember I didn’t always watch the games. Often we used to play our own mini football matches. there was plenty of space behind the goal or near the club house. Many people never seemed to emerge from the club house and watch the football. At half time you could nip out of the ground to the nearby fish and chip shop in Risbygate Street closed now of course. Some times we attended training with the players. My main memory here was practicing throw ins. They used a large medicine ball which seemed to weigh a ton. After you had thrown that a few times throwing a normal ball was easy. Tonights run was an easy circular route around Horringer School,Hospital Road, Cullum Road, Newmarket Road and Home . I was still a little tired from my long run on Sunday and ran a fairly slow time. My number arrived for the Bungay 20k. I am number 66.